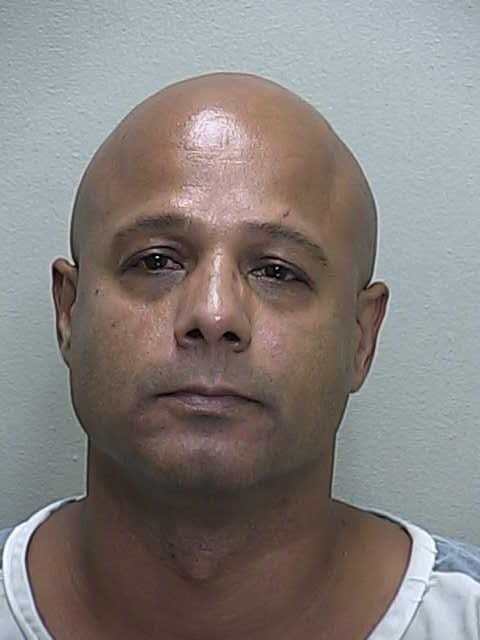 Ocala, Florida — Ocala Police Department Robbery/Homicide Detective Miguel Gauthier was arrested on Sunday, September 29, 2013, after crashing his car into a brick mailbox at approximately 9:30 p.m. According to Florida Highway Patrol Officer Geoffrey Pubillones, Gauthier was traveling south on SE 8th Street Road when he drove off the roadway and onto the lawn of 6510 SE 8th Street Road, that is when he struck a brick mailbox with the right front of the vehicle. When the trooper arrived he observed a white Nissan Altima with damage to the front end and the broken mailbox. Upon making contact with the driver identified as Miguel A. Gauthier, 47, the trooper noticed the driver had bloodshot watery eyes and his pupils had a slow reaction to light. Gauthier’s speech was also thick-tongued, according to the trooper. The trooper reported a strong odor of alcohol coming from Gauthier’s breath and that, he had to lean against his vehicle to keep from falling over while talking to the trooper. A witness confirmed to the trooper that Gauthier was in fact behind the wheel of the car when the crash occurred. According to reports, after the trooper conducted the traffic crash investigation, the trooper then informed Gauthier he would proceed with the criminal portion of the investigation for suspicion of DUI and asked him to perform a field sobriety test, which he agreed to. The trooper read Gauthier his Miranda Rights which was witnessed by deputies Elizabeth Hart and Sidney Porter. Gauthier told the trooper he understood his rights. When Gauthier was asked where he was driving from, he replied, “Just was hanging out with friends”. The trooper reported that Gauthier was impaired to the extent that his normal facilities were impaired to the point where he was unable to operate a motor vehicle. After being placed under arrest and transported to the Marion County Jail, Gauthier refused to submit an alcohol breath test. Gauthier was not on duty and he was driving in his own personal vehicle at the time of the crash. The 2009 Nissan Altima he was driving sustained about $7,000 dollars in damage, according to reports. Gauthier was taken to the Marion County Jail and booked on one Count of DUI and one count of DUI with Property Damage. He has been released on $1,000 bond. Detective Miguel Gauthier has worked for the Ocala Police Department for approximately 16 years. Ocala Police Department officials stated that Detective Gauthier is currently suspended with pay.